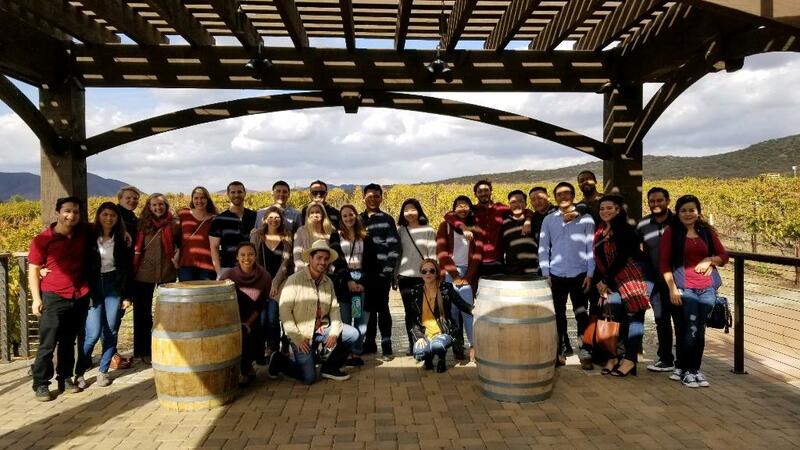 The 2018 YMF Wine Trip in Temecula was a day filled with memories, socializing, and, of course, wine tasting. The event occurred on Saturday, December 1st and lasted from approximately 9 AM to just after 5 PM. The event began with a limo-bus picking up its 29 attendees in Irvine and heading to Temecula for a beautiful day of wine tasting. The first destination was Baily Winery. At this winery, our group was able to choose from a range of wines to enjoy and, also mingle with one another in the winery’s tasting room. This winery provided a nice sentiment for the trip because everyone was able to leave with a souvenir glass provided by the winery. The next stop on the itinerary was Chapin Family Vineyard. Here, the winery hosted our group for a sit-down tasting. The group was seated down at one long table so one was able to chat and really get to know the members and friends they sat nearest too. Away from the table, the winery also provided beautiful views of the vineyards and a patio, so it was the perfect spot for a group picture. The lunch spot was at the third winery for the day, Maurice Car’rie. At this spot, we had sandwiches and plenty of snacks provided by YMF. Attendees also had the opportunity to buy famous, fresh-baked sourdough bread with melted brie cheese inside. It was a tasty addition for our wine tour and gave us plenty of sustenance to depart for the last winery. The group closed out the wine tour at Longshadow Ranch Vineyard and Winery. This winery was a fantastic location to end the trip at because they had an expansive tasting room and outdoor area. The best part was that the winery had corrals of farm animals to view and pet. After the last winery, the limo-bus with all 29 attendees departed for Irvine. Although it was sad to see the day end, the attendees gained new memories, new friends and an excitement for next year’s trip!